The Colegiata de Santa María church in Roncesvalles, Spain, has two origin stories. The first grows from its location; the second is anchored in a memory. As for location, the structure was erected in the western foot of the Pyrénées to welcome pilgrims who successfully completed the mountain crossing. It was consecrated in AD 1219 as the medieval surge of Santiago-bound travelers was growing. The memory here is connected to a Marian apparition. According to tradition, the Virgin Mary (La Reina del Pirineo, or “the Queen of the Pyrénées”) once appeared to a child; a structure was built on the spot. Roncesvalles became one of the most important Marian sanctuaries in the region. It is celebrated by folk on both sides of the Spanish/French border to this day. At another point in time (no one knows for sure) a 13th century statue of wood and silver was brought here from Toulouse. Known as Nuestra Señora de Roncesvalles, “Our Lady of Roncesvalles” it was originally hidden behind a curtain. Now it is prominently displayed beneath a canopy on the altar. You can see the canopy in the photograph above, suspended before the stained glass windows. 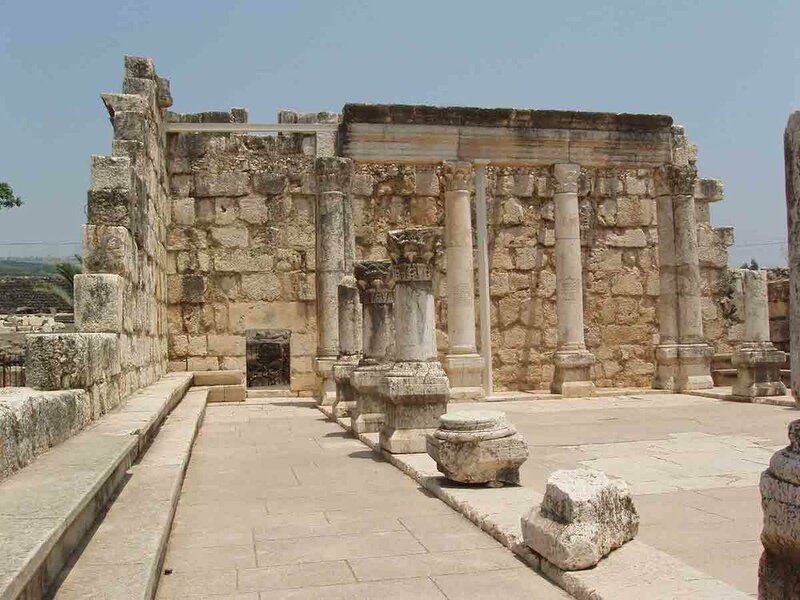 This synagogue in Capernaum, Israel, is on the list of sites we will be visiting in January, 2019, along the Jesus Trail. Other stops include Nazareth, Cana, and Magdala. You are most welcome to join us, but realize that the window for signing-up is closing very soon. Click here for more information or email me directly at markziese@gmail.com.